McNabb. He also expects to see some sort of software-based brokering technology sitting on top of all these services. This software will automate functions such as procurement, delivery of services and charge-backs to user groups, he adds. Still, the as-a-service model does not mean life will be easy for public sector CIOs. "One should assume that organizations will acquire these capabilities from different sources, which adds additional layers of complexity for everything from interfaces to data to service levels," Ash of the NRC says. 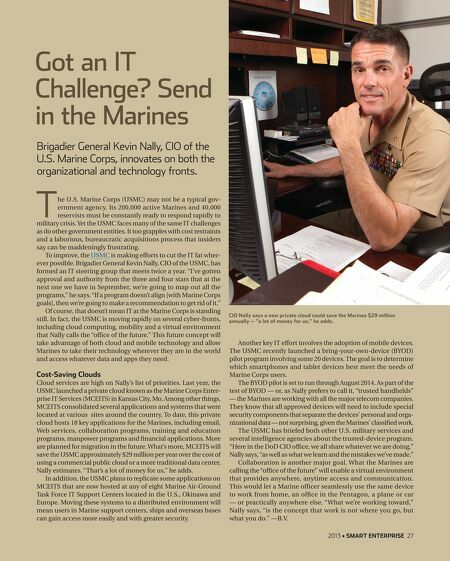 "The challenge will be how to effectively manage it all." Fortunately, IT executives can rely on new technology tools to help them manage the transition. These include interactive portals, collaboration tools, IT service-management platforms and businessmanagement tools. "There is a major push toward incorporating these capabilities into one platform for cloud brokering and orchestration to provide a single point of management and control, and [to bring] visibility into the enterprise," says Accenture's Smith. Cloud Formations Which of the following types of clouds has your organization already adopted? Commercial public cloud services from Amazon, Microsoft, others 18% Private clouds operating inside government data centers 14% Public cloud services adapted specifically for government agencies 8% Hybrid clouds that mix public and private clouds 4% Shared/community clouds intended for specific groups or professions, such as scientific research 4% Cloud services made available through government portals such as Apps.gov 2% 0% 5 10 15 20 DATA: InformationWeek, "Federal Government Cloud Computing Survey," 83 federal government technology professionals who are using or assessing cloud services, September 2012 Rushﬁnn of CA Technologies similarly expects to see rising demand for project and portfolio management tools that help public sector IT leaders more easily manage the growing number of services their agencies will use. He is already seeing these types of platforms, including CA ClarityTM PPM, being adopted at the state and local government level. The solution helps organizations by providing capabilities that include application portfolio management, governance and best practices, and budget and cost management. 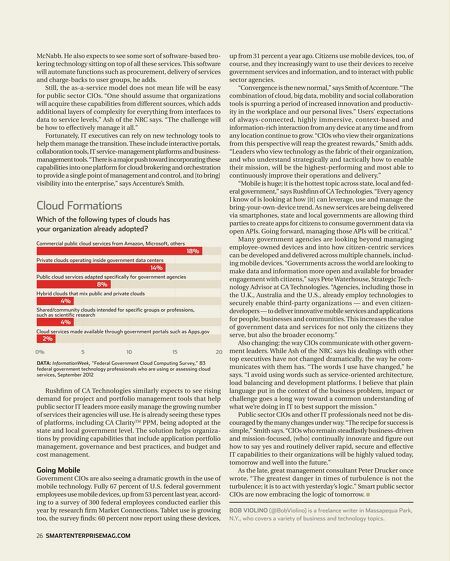 Going Mobile Government CIOs are also seeing a dramatic growth in the use of mobile technology. Fully 67 percent of U.S. federal government employees use mobile devices, up from 53 percent last year, according to a survey of 300 federal employees conducted earlier this year by research ﬁrm Market Connections. Tablet use is growing too, the survey ﬁnds: 60 percent now report using these devices, 26 SMARTENTERPRISEMAG.COM up from 31 percent a year ago. Citizens use mobile devices, too, of course, and they increasingly want to use their devices to receive government services and information, and to interact with public sector agencies. "Convergence is the new normal," says Smith of Accenture. "The combination of cloud, big data, mobility and social collaboration tools is spurring a period of increased innovation and productivity in the workplace and our personal lives." Users' expectations of always-connected, highly immersive, context-based and information-rich interaction from any device at any time and from any location continue to grow. "CIOs who view their organizations from this perspective will reap the greatest rewards," Smith adds. "Leaders who view technology as the fabric of their organization, and who understand strategically and tactically how to enable their mission, will be the highest-performing and most able to continuously improve their operations and delivery." "Mobile is huge; it is the hottest topic across state, local and federal government," says Rushﬁnn of CA Technologies. "Every agency I know of is looking at how [it] can leverage, use and manage the bring-your-own-device trend. As new services are being delivered via smartphones, state and local governments are allowing third parties to create apps for citizens to consume government data via open APIs. Going forward, managing those APIs will be critical." Many government agencies are looking beyond managing employee-owned devices and into how citizen-centric services can be developed and delivered across multiple channels, including mobile devices. "Governments across the world are looking to make data and information more open and available for broader engagement with citizens," says Pete Waterhouse, Strategic Technology Advisor at CA Technologies. "Agencies, including those in the U.K., Australia and the U.S., already employ technologies to securely enable third-party organizations — and even citizendevelopers — to deliver innovative mobile services and applications for people, businesses and communities. This increases the value of government data and services for not only the citizens they serve, but also the broader economy." Also changing: the way CIOs communicate with other government leaders. While Ash of the NRC says his dealings with other top executives have not changed dramatically, the way he communicates with them has. "The words I use have changed," he says. "I avoid using words such as service-oriented architecture, load balancing and development platforms. I believe that plain language put in the context of the business problem, impact or challenge goes a long way toward a common understanding of what we're doing in IT to best support the mission." Public sector CIOs and other IT professionals need not be discouraged by the many changes under way. "The recipe for success is simple," Smith says. "CIOs who remain steadfastly business-driven and mission-focused, [who] continually innovate and ﬁgure out how to say yes and routinely deliver rapid, secure and effective IT capabilities to their organizations will be highly valued today, tomorrow and well into the future." As the late, great management consultant Peter Drucker once wrote, "The greatest danger in times of turbulence is not the turbulence; it is to act with yesterday's logic." Smart public sector CIOs are now embracing the logic of tomorrow. I BOB VIOLINO (@BobViolino) is a freelance writer in Massapequa Park, N.Y., who covers a variety of business and technology topics.